It’s not enough to fill your WordPress website with content, or even the websites of others. Good writing, while important (and we’ll discuss more of what “good writing” is later) is nothing without proper on-page optimization. If you do format and publish your WordPress website “up to standard” you will not benefit from any of the tools sites like Google and Bing have created for your benefit. In the introduction, we explained how search engines work. In this chapter, we’re going to discuss how proficient website developers and owners actually ensure that all of their hard work is going to be noticed by search engines. These are the “standards” of Internet marketing, what everyone strives to do so that they won’t suffer the wrath of search engine giants, who can single-handedly bury a business with their algorithm updates. If you don’t adhere to the new and continuing rules of web publishing, all the great text you develop is in vain. Let’s divide this section into two parts. First, internal SEO practices, and then external practices. All of these methods are “white hat” tactics, which are considered good SEO practice that will usually always work. 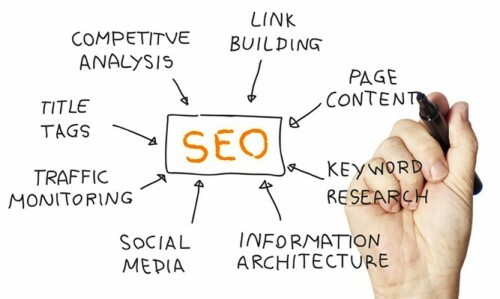 External SEO occasionally changes, and factors are oftentimes readjusted in terms of importance because the search engines (and particularly their algorithm adjustments) are constantly testing the web marketing industry. Besides accurate on-page optimization and smart content, there is no way to guarantee a top spot in SEO, since no major search engine company is going to come out and promise you anything. Still, there are a few tactics and techniques that are still a good “bet” on getting your site noticed. Let’s begin with the right on-page optimization. Original. Never plagiarize anything. If you must quote somebody, do limit the quoted text to about two sentences. If you are running a reprint, be sure to credit the original author for the piece. However running full-length articles of other sites is discouraged. The best thing to do is to include a special “no follow” command on the page, which tells the search engine this is not an “original” piece, but a reprint that is not claiming to be original. Keyword-friendly. It uses carefully chosen keywords that users are actually searching for. Published on a WordPress website that is easy to navigate and user-friendly. File optimized. This means making sure all images have replacement text and a file name appropriate for the image, based on keyword research. Appropriately titled, in both the web page URL as well as the page title itself; both should be keyword friendly. Header-ready, which reflects important keywords. While bold and italicized words might stand out, text in <h1, h2, h3 and h4> headers is best for drawing the attention of the web crawler. A strong internal linking structure. Contrary to what some believe, web pages are not just accidentally discovered. Web pages must all connect to a previous linked webpage, so that there is a “web” of interconnected pages within your WordPress website. Your home page should be linked and connected to all of your other webpages, or at least, the pages you want the search engine to index. The links must be text based, and preferably in context, as opposed to only tabs. Fully operational with no broken links. If the search crawler finds a broken link it will penalize you, only so that other users don’t stumble upon the same broken length and leave unsatisfied. Optimized for meta tags and page descriptions. Not everyone agrees that meta tags are necessary anymore but meta descriptions do still provide informational content to the search engine on what to report to users in the text preview, which is returned after a search. This should be keyword-friendly and point attention to what is covered on the page. Loading properly and quickly. Page loading speed is an underrated factor in SEO success. Search engine spiders can actually clock a “loading speed” for your website based on file size and page code, so make sure to test the site and make sure it isn’t bogging down the user’s time. A valuable page with a minimum number of informative text; otherwise it is a worthless page. A greater number of off-site positive reviews, as opposed to negative reviews. Create external links pointing back to your site, which shows that your site has popularity. All of these linked pages, most of which are more popular than your site, will direct attention to your site and build a large collection of links. Maintain quality links. The old practice of simply exchanging links with multiple other sites and webpages is an old strategy and one that search engines are not acknowledging as a “legitimate” link any longer. Use quality anchor text in linking. This is becoming an increasingly important issue in SEO. The old “click here” standard is long gone. The best strategy today is to create links within text that direct attention to the new page in a logical and coherent manner. Create a “senior” site with longevity behind it. Your site should be older than cheap and lower quality competitor sites popping up every day. Have a higher PR ranking already to get special favors from the search engine. Must get rid of an abundance to affiliate links, which cheapen a WordPress website. There are multiple other factors to consider in considering both internal and external linking, and many of these factors, while individually irrelevant, can contribute significantly when combined. Google has officially announced some precedents, while Google employees have hinted about other small but significant factors in determining search rankings. The keyword should appear near the top of the screen. The keyword should be the first word in the domain. The keyword should appear in the subdomain. Domain information should not be kept confidential. The page should have a substantial contact page. The terms of service and privacy should be clearly published. The site and domain should be trusted. The site should have a site map. In addition the most important pages should be favored in respective order on the sitemap. You can auto-create one using a WordPress plugin. The web server should be consistent and not be constant down or running slow. There should no oft-repeated instances of downtime, which could affect the site ranking. SSL certificates for commerce sites should be included for commercial sites. There should be no duplicate pages or duplicate content within pages. This is plagiarizing yourself, in essence, and will likely be penalized. There should not be too many redirects, especially 301s. The site should be officially listed on DMOZ, Yahoo Directory, and other trustworthy search sites. The site should not have high bounce rates. The site should have high repeat traffic. The site’s blog and interactive pages should have lots of comments. The site should have users who stay a long while perusing the site. The site should not have questionable friends or be in a bad neighborhood; meaning sites that are notorious for spamming, like pharmacy sites or payday loan sites, should not be linked to. Anything sneaky in re-directing users to unrelated page is usually a penalty. Pop up ads will cost you SERPs, as will any distracting ads. Sites that create too many ads above the “fold”, in unnatural locations that compromise the visual integrity of the site, are also susceptible to penalization. Including bullets and numbered lists, as well as shorter paragraphs, makes your text easy to read, and thus more searchable than a page with no such consideration. An unusually high number of outbound links can eventually affect a site’s search-ability. If the majority of a site’s external links all come from the same source, this is not indicative of diverse and mainstream popularity. It may be treated as spam. The sites you link to are becoming increasingly more important, including their text length. Small word count pages do not necessarily make for authoritative links. Higher trafficked websites, including brand name products and services, are often highlighted, as these are commonly what people are looking for when they type non-specific search terms. Authority linking is becoming increasingly important, as search engines now look for sites that are weighty in reputation, rather than paying much attention to dozens of sites with low PR traffic and amateur content. There is more of a trend in rewarding original authors of original pieces, and identifying true authors by their own links to their information, via Google Plus, or other social pages. Even amongst the blogging community, more search traffic is being lost and sites penalized because of excessive links. The blogging community got the bright idea to turn their industry into something like an article directory. As “guest blogging” became the cool thing to do in 2011 and onward, writers got carried away and began over-placing articles and over-linking, treating the blogs like content “mills.” This was the very same mistake that article directories made years before, and they also felt the brunt of new algorithm updates like Penguin and Panda, which sought to penalize websites that were over-optimizing and putting inferior quality articles all over the Internet, hoping for search traffic. The situation has become so dire that no SEO consultants are recommending publishers to use the “no follow” command, alerting search engines to ignore stories that are reprinted or links that are overly promotional in nature. There is a greater need for articles that are educational and useful, and less of a need for articles that exist mainly to promote a professional and benefit him with yet another link back. Remember that major search engines like Google can actually blacklist users and websites by IP address. Obviously, keeping your site white-hat friendly and conforming the Search Engine Protocols is always a perfect idea for your on-page optimization. As you can see, much of this is related to common sense. A website owner has the obligation to test his or her WordPress site and to ensure a quality viewing experience. The WordPress site should be optimized so that you make it easy on the search engines to index and find the new content you produce. A website owner also has to deal respectfully with WordPress sites outside of its neighborhood, carefully maintaining quality links. However, even after you complete these basic steps of on-page optimization, you’ve still only begun to compete. There is a lot more to learn. Our next three chapters will detail two of the most important ranking factors: content and keywords.